This is truly the most peaceful, relaxing and beautifully furnished cabin we have ever rented. Listening to the sound of the river is like being put into a trance; no better way to fall asleep. Thanks and we’ll be returning. Welcome to a cabin on the sky! 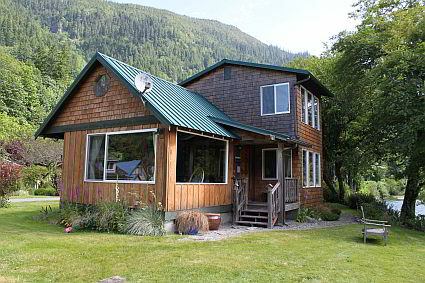 A Cabin on the Sky is a vacation rental home located on the North Fork of the Skykomish River in picturesque Index, Washington where you are hugged by the mountains and whispered to sleep by the flowing river. The cabin is a two bedroom, one and a half bathroom home that sleeps four comfortably, and it's fully equipped for all of your living needs. The Town of Index is surrounded by mountains, a river and parks. A few of the parks are, Forks of the Sky State Park, Heybrook Ridge County Park & the Wild Sky Wilderness. Did we mention we have our very own Doolittle Park? Get away for a romantic weekend. Spend the week fishing and rafting along the Skykomish River. Relax in the great outdoors. A Cabin on the Sky offers unparalleled views, peaceful serenity, and many excellent recreational opportunities. Whatever your desire, your stay here will be a memorable experience. For reservations follow the links on our site or call us at (360) 793-0100.